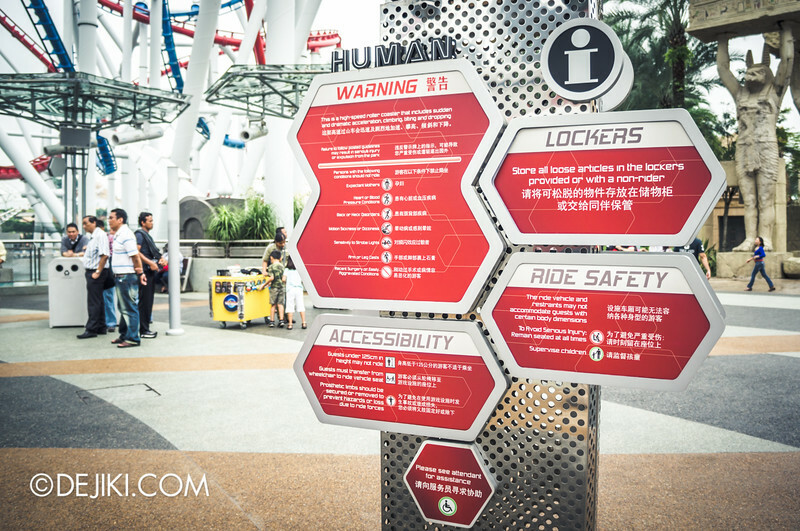 It’s time for another update on Universal Studios Singapore! Do you see something new here? 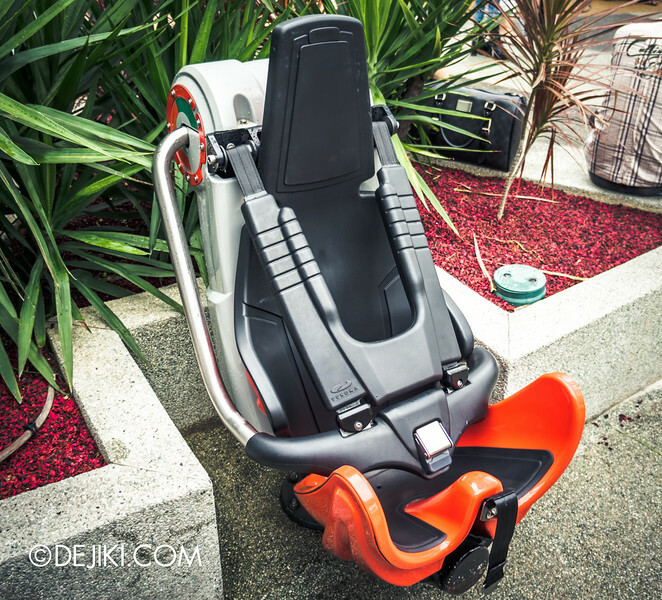 This is the modified seat for Battlestar Galactica: HUMAN. 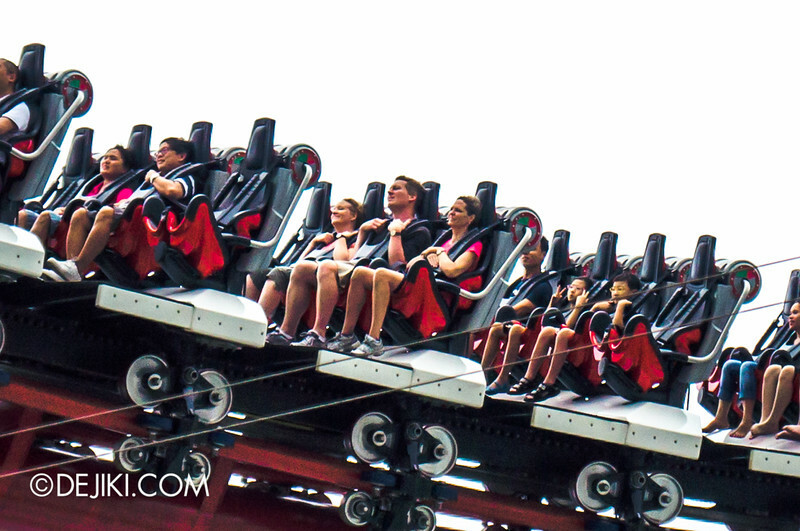 The original design does not have the shoulder restraints (the black U shaped item with the Vekoma logo, that looks like a portion of a vest) – just a lap bar. Shoulder restraints pads have been added to Battlestar Galactica: HUMAN. The revised restraints, as a whole, resemble the ones used for CYLON. This removes the rider’s “illusion of freedom and vulnerability” of the original lap-bar only design. While I’m not sure what’s the real rationale behind this – and the crew refuse to say, the restraints were installed yesterday (13 March 2012) onto one train. The second train still has the original lap-bar restraints. Having taken the ride over 100 times, the revised version feels very tame and not as thrilling as before. The “kick” at the first drop that the original version was infamous for, is GONE. I’ve also observed that riders with narrow shoulders will have difficulty putting their hands up with the revised restraints. I enjoyed what the lap-bar only design allowed: The unrestricted ‘open’ feel, which allows riders to feel very exposed during the ride, central to the dueling design of Battlestar Galactica. It also translates to freedom of movement – you could get flinged in all directions and even LEAN on the person next to you! But the most thrilling aspect would be the harrowing, almost ‘standing while floating’ stance at the first drop. Some roller-coaster fans have told me that they’re disappointed that HUMAN no longer has the ‘magnificently insane’ and “seemingly dangerous’ drop it provides. Maybe that was never part of the ride’s design and could be potentially dangerous, and this change fixed that. This is possibly the park’s most controversial move this year and I expect rage from fans of the original design. 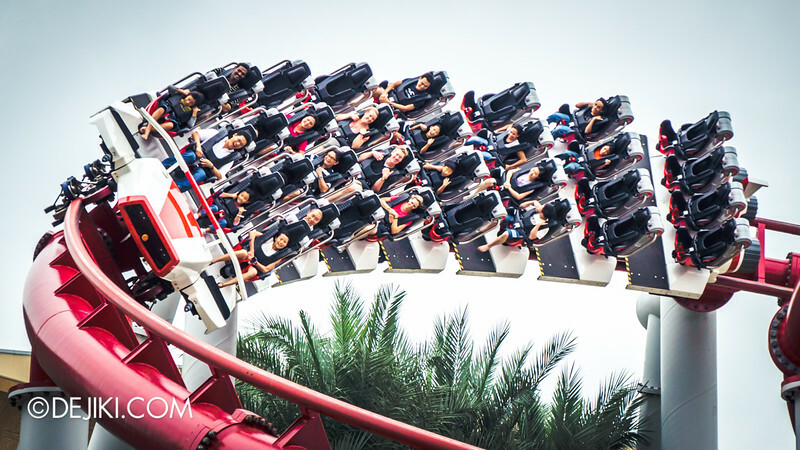 It does sound a little too much to have shoulder restraints for a roller-coaster that does not invert, but it does help for some sections where the G-forces are too extreme and some riders may end up leaning forwards, which can sprain their back as having the shoulder pads meant that they’d be sitting up right. 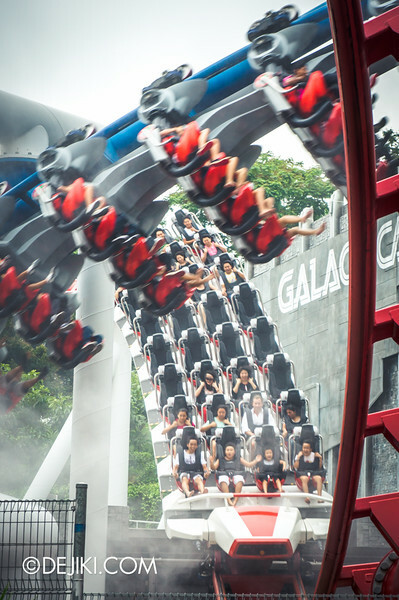 The park is obsessed with safety – with lapbars even for a slow water ride like Madagascar – but given how theme park controversies have caused rides in Singapore to shut down, it’s probably wise to have such preventive measures. The thing is, why now? The old design was used for more than a year, and was still this way when the park opened in 2010. Was the old design “unsafe”? Was there an accident? 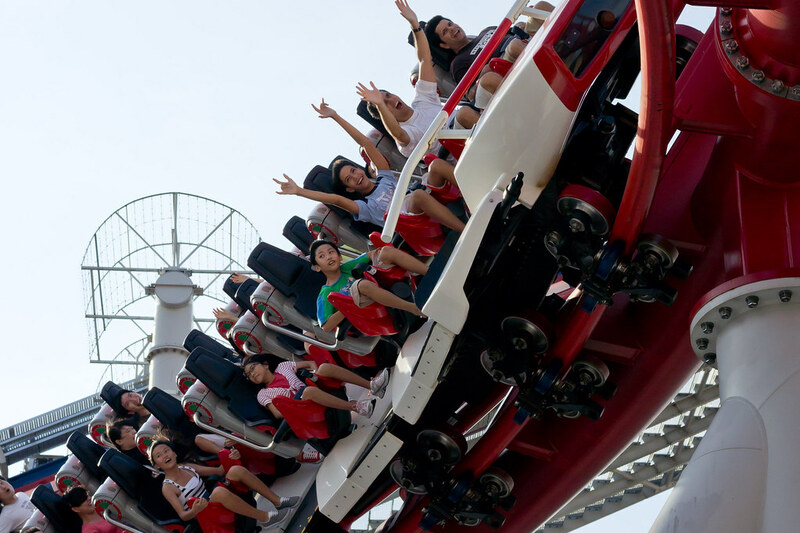 The only two known incidents this year involved a guest who couldn’t consistently fit into the seats, and another case involving a woman who claimed that she was injured – getting a – wait for this – 0.5cm scratch on her face during the ride. Or maybe, this is the best solution to change the ride’s reputation for being uncomfortable for some, as there are no bars or rails to hold on to. In the past, riders would grab onto the seats (and the park added padding to the seat edge) and it is likely to cause strains on the arms. It also causes riders to lean forward, rather than sitting upright and keeping their head on the headrest as instructed. Having the shoulder restraints would cause riders to instinctively, hold onto the padded “vest” section of the restraint and sit upright, as you can see in the photos above. Adding the shoulder restraints did not alter the height requirements for Battlestar Galactica: HUMAN. Riders will still need to be at least 125cm tall to ride. 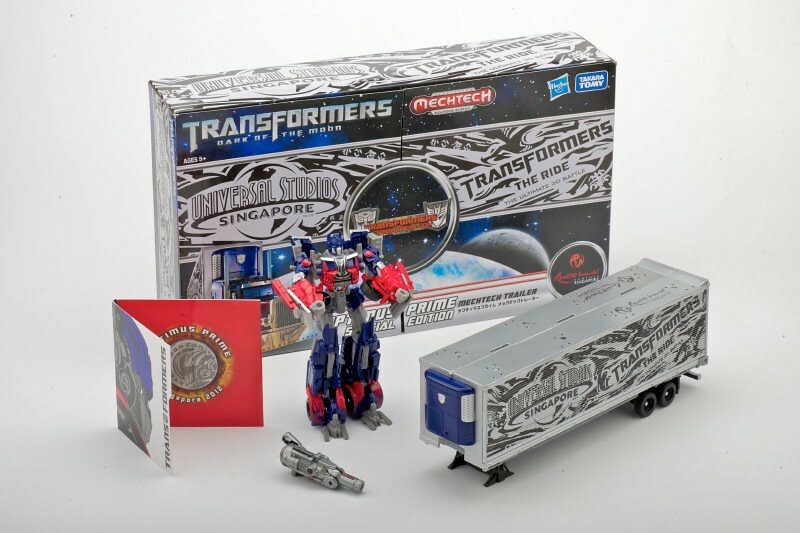 This is a Singapore exclusive and after the end of Cybertron Con, the Transformers Supply Vault is likely to be the only place that sells this version. Does anyone overseas want me to buy for them? Apparently the Hollywood Dreams Parade had some minor changes, including a modified soundtrack and some new characters for the Shrek segment. I’ll try to visit the park again and update if possible. Thanks to Joel Lee for the tip-off! Actually these bottles appeared in January but I’ve decided to only write about them now. 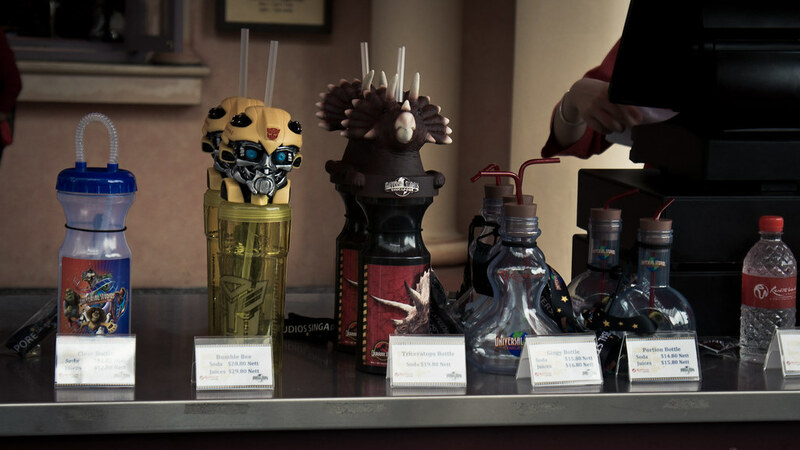 The most popular bottle, Bumblebee, is going for $28.80 (including soda of choice) and the Triceratops bottle goes for $19.80. The two Far Far Away themed bottles go for $15.80 (Gingy, or the “Christmas Tree”/Pear shaped one) and $14.80 (The famous Potion bottle). The classic and generic Universal Studios Singapore bottle is priced at a modest $11.80. Add $1 more and you can choose to fill your bottle with fruit juice. The primary advantage of these bottles is that you can bring them back to the park during your return visits and refill them with soda for $2. 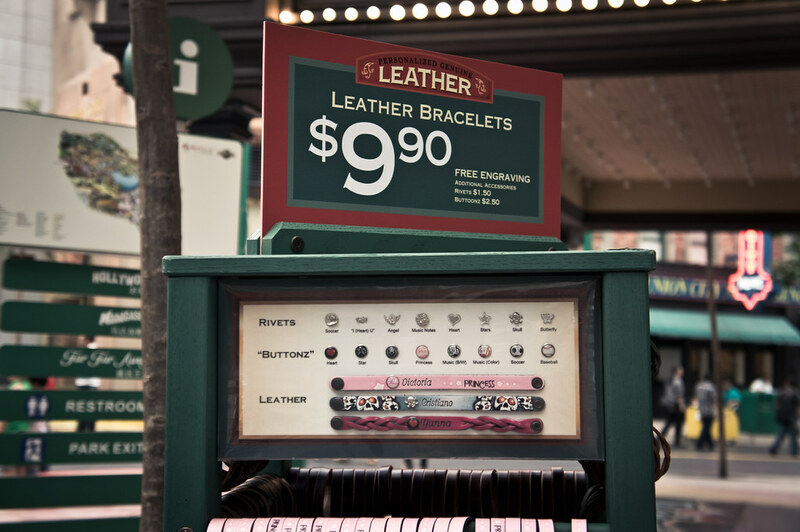 The Leather bracelet stall at New York now has displays showing what the add-ons actually are. These bracelets are easy and affordable souvenirs for park guests, but certainly needs something park exclusive designs to really catch on. There’s a second stall at Jurassic Park (outside Jurassic Outfitters). As nothing major is expected to occur in the park in recent months, updates may be more infrequent. I’d prefer to write more within one post instead of posting regularly with nothing much in between! Agree, the feeling is really gone, so there is a lack of thrill and adrenaline. The whole thing becomes a “walk in the park” compared to the previous version. I would understand if there are real and legitimate concerns of safety of the passengers, as such I do hope RWS/USS releases some sort of explanation as to why they have decided to perform the modification. I do hope they revert to the old restrains, although semantically, the ride is really rather “human”. The feeling of floating after the first drop is my favorite part of the ride!!!! I have to say that I am very much disappointed. I do have a question. The park management announced that there would be three new attractions by 2013. It means before 2013 or in 2013? The feeling of floating is still there but it’s not the same as before. It feels just like CYLON’s drop now. “By 2013” typically means before 2013, but well – it’s often a rough estimate and delays are expected. i went thru google to find any article related to the new modified restraints. I need to know why they modified it. I have to agree with you. The adrenaline rush was not the same as before. I’m someone who always feel afraid when riding a roller coaster, but when i ride the modified restraint, i just didn’t feel the “scared” feeling i felt last year. Kinda dissapoint me a bit actually because thats the only reason i went on a roller coaster, to challenge myself with the thrill and adrenaline rush. I went there today with the wife! Upon returning back to kl we realized we lost the souvenir keyholders we bought! Any chance u could get us a couple and we send u the money? A longshot…but worth a try. Thanks.